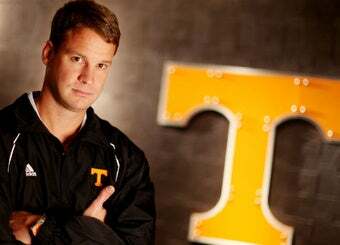 Tennessee has reported itself to the NCAA again, this time after Lane Kiffin mentioned a football recruit by name on his Twitter. In other news, Lane Kiffin has a Twitter account! Actually, his 140-character ramblings are incredibly dull. (Let's watch more game film!) Also, the offending Twit in question was actually sent by one of his assistants, because Twitter is filled with nothing but liars. But it did mention a committed, yet unsigned player by name—coaches are not allowed to discuss any unsigned player—and since UT is completely devoted to transparency and fair play, they called the cops on themselves. This may be the first ever Twitter-based recruiting violation and it is certainly the most boring. However, I think we can learn something constructive about Lane as a result of this snafu. Kiffin has 4,600 people following him, but he has only found three fellow Twits that he are interesting enough to follow himself: THE_REAL_SHAQ (obviously), Bruce Pearl (sure, why not?) and ... Matt Leinart? Of all his former players, that's one he choose to keep tabs on? (The guy hasn't even updated since the Super Bowl.) Is Lane is still hoping to be introduced to Paris Hilton?